Jim said that we were going to find a boat for us so this is our story of searching for a boat. 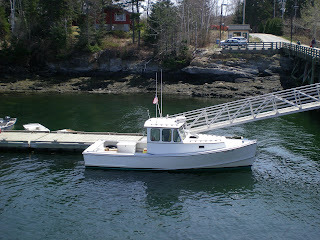 We decided to go to the islands off of Maine. This is on a ferry boat that is also the mail boat for the islands. There are several islands up there some are private, some are state parks, and some you can live on. We both love the islands and think that maybe someday we will purchase a home on one of them. But for right now we will just enjoy going up for a day trip. We caught the ferry in Portland, and it was a two hour ride. It stopped at several different islands, the one that we were going to is called Cliff Island. It has a lot of cliffs verses sandy beaches. The water is more gray than in NC but it is still beautiful. The sun was shining and we both got a sunburn. The wind was blowing just a little to keep it cool. You might ask is this the boat??? No, this is not the boat that we are looking for. However, it is a very nice boat! 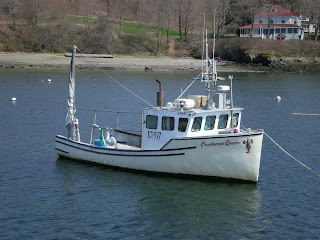 There are of course a lot of lobster boats in Maine. Up here they pronounce lobster as lobsta. They don't believe in moving there mouths to talk. I have decided that it is a very efficient way to talk but hard to understand sometimes. As you look over the water you will see a lot of floats telling you where you left your lobster traps so that you can come and find them again, later in the day. Is this the boat? Well, no this isn't the boat either. 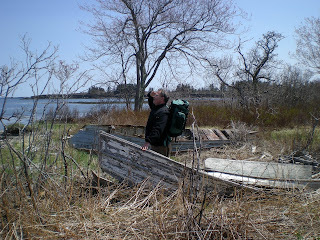 However, this was a really nice island that had a lot of great homes on it, but not the right boat. 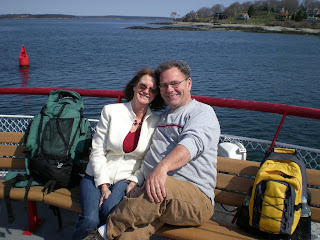 It was great to see what the homes look like on the islands of Maine. There were some very small ones and on one island that is a private island had a house on it the looked like it should have been in Atlanta instead of on an island off the coast of Maine. We finally made it to Cliff Island it was a great island with lots to see and a good selections of boats. But none of these were them. 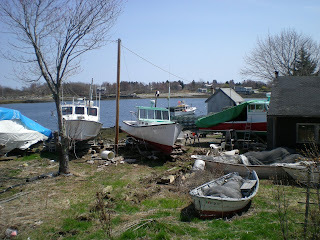 This is a place where the lobsta boats dock and people of the island come to buy the lobstas right off the boats. It is also where they can repair their cages, boats, or anything else. Jim has purchased many a lobsta here. We started to walk around the island looking at all of the nice homes, planning, wishing and deciding that maybe someday. About this time the camera died and I could not take anymore pictures of the island. We did however have a great day. Laying on a grassy knoll just above the cliffs and ending up napping, writing in our journal and just enjoying each other. I can hardly wait to go back when it is a little warmer. It is so wonderful to have all of these adventures in a new area. To be able to experience some of the places that Jim has gone for so long and has great memories of. Looks like a wonderful outing. What a wonderful way to spend time together. I too agree with the boat...not to safe looking, but Jim looks great in it. I love Maine! So beautiful and such a fun place to explore. Also the lighthouses are pretty amazing there. Looks like a fun adventure!